It’s pink lady season in Sydney, so I’m buying them in droves at our farmers market. This is, of course, an attempt to recover from pasta-pizza-prosciutto withdrawal, and to satisfy my by now ginormous belly. Pink ladies are my favorite apple and, unlike in the States, they’re seasonal here, meaning I got to get them while the getting is good. I should start out by saying that I have an ideal apple cake – The Apple Cake – the elusive recipe for which has taunted me for years. YEARS. It’s the apple cake made by the bakers in the dining room on my family’s kibbutz in Israel. And these are not friendly, neighborly bakers. They wouldn’t share the recipe with me – even after I bought maybe 34 apple cakes in the space of a few months and promised to keep it secret – so I sent my 89-year-old grandmother, a kibbutz veteran, to ask for the recipe. Maybe not the smoothest move I could’ve made, sending a little, sweet old lady in my stead, but those hussies wouldn’t even share it with her! I’ve been pining after this apple cake since it made its first appearance about 8 years ago and so far have been woefully unable to recreate it at home. It has a slight crumble on top, and big chunks of cinnamon laced apples sitting in big pockets in an impossibly moist crumb. My grandmother always has one ready when we arrive, and assures me that she’s asked for the recipe again and again. My attempts haven’t been bad, really (apple cake by definition can’t be bad), but they’re so far off The Apple Cake that I’ve (nearly) given up hope. I aim lower. My apple cakes are different every time (just because I’ve given up hope doesn’t mean I’ve given up trying), and usually they’re fine. Nothing worth blogging about or trying to recreate. They’re usually approximation of things I find online after Googling something like “Jewish apple cake” or “best apple cake” and choosing a recipe based on how similar the picture looks to my Platonic ideal. 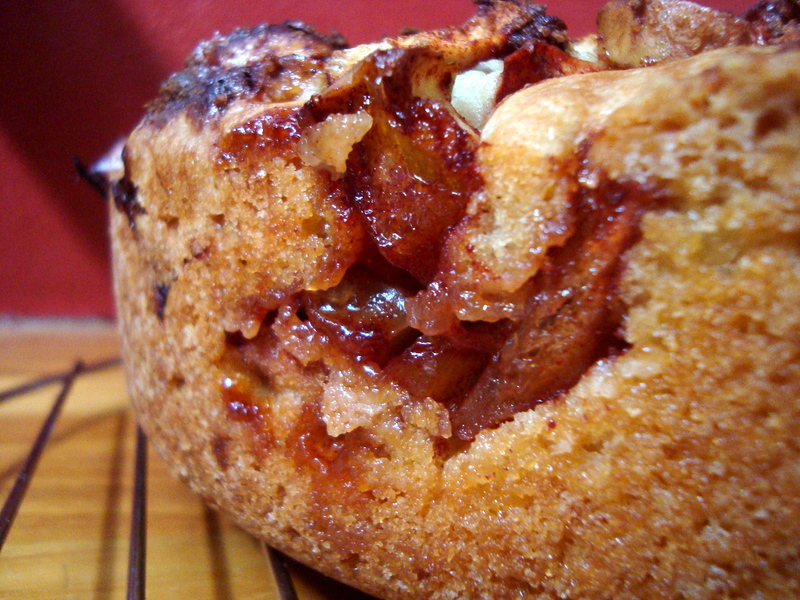 This time around, I Googled “moist apple cake,” as I’m wont to do, and chose the appropriate picture. It brought me to Diana’s Desserts, and a little recipe called Chilly Day Apple Cake. In the little introductory blurb, Diana had written, “It’s one of my very favorite cakes and the recipe is definitely a keeper. '” And you know what? It really is. Of course I didn’t follow her recipe exactly, but besides being too lazy to peel the apples and reducing the more than 2.5 cups of sugar in the original, I didn’t really mess with it too much. Because it’s a damn good apple cake. One definitely worth repeating. One that will, for now, soothe the gaping hole in my life where The Apple Cake recipe should be. Update 2/12: I’ve just made a very successful batch with peaches. The floodgate for other kinds of fruit are open! Adapted from Diana’s Desserts, which has a million recipes I want to try (Raisin Bran Muffins or Daisy Twist Bread, anyone?). Diana says it feeds 8 – 10 but I would put that at 12 – 15. (I made two cakes, froze one, and we were good for breakfast for at least a week.) This is a sweet, moist, crumbly cake that you will definitely consider a keeper, no matter how high your apple cake bar is set. In a large bowl, toss the apple chunks with 5 tablespoons sugar and the cinnamon. Set aside. Preheat oven to 350F/180C. Grease a large cake tin (or two cake tins). In a bowl, mix the sugar, eggs, vegetable oil, orange juice, zest and extract until uniform. In another bowl, mix the flour, baking powder and salt, then add these ingredients to the egg mixture. Pour half the batter into the prepared tin, add half the apple chunks on top, add a bit more batter, the rest of the apples, then top with the remaining batter. Bake in a preheated oven for 1 hour – 90 minutes, depending on size of the pan(s) you used. It will be done when a toothpick inserted in the middle comes out with some crumbs attached. Cool in the pan for 15 minutes before carefully inverting on a serving plate. Perfect for breakfast, brunch, tea or dessert with some ice cream on the side. Just having my coffee and that apple cake would be perfect. Hurry!! Come and visit. Bring cake! certainly looks moist !! yum! Ohhhh yummmy! It’s toooo hot to cook and there are no ingredients in my sublet, so I have to do without fun cooking adventures for the time being 😦 Lots of English muffins for dinner these days. Looks really yummy ! One question,can you substitute the cup of oil for butter or applesauce? I ammaking this either way. Hi Terri. I wouldn’t substitute the oil for butter, but I think applesauce would be fine. I’d start by substituting only 1/2 or 1/3 of the oil and seeing how it turns out. Happy baking! Looks Amazing! I was was looking for apple cake/bread recipes last night and thought of you, so I called my mother to get the info for your blog and Voila’ !! Gotta use up a bunch of apples and, wow, I can’t wait to try to pull this off tomorrow, haha. Hope all is well!! Come visit Colorado next time your in the States. Much Love!